Merfyn Owen and Clay Oliver met Volvo race officials and some of the sailors at the Volvo stopover in Boston in 2009. On the agenda with the VOR management were discussions about the new rules and cost regulation ideas. The main reason for us both being in town however was frankly to look at the existing fleet and listen to the guys off the boats and remind them of our work and interest in the VOR as well as the considerable amount of time and effort we have spent designing for the previous two editions. 2008 Volvo 70 developed in partnership with two potential syndicates by Owen Clarke Design/Clay Oliver and associates. Our involvement with Volvo 70 design goes back to May of 2003 when Owen Clarke Design formed a Design Team with Americas Cup/Whitbread designer Clay Oliver and a group of specialists to design their first VOR70. Hulls were systematically developed, engineered and mass audited in preparation for the first phase of tank testing which was based on a number of moderate beam single and twin rudder designs. The decision to start at this end of the design spectrum was based on the considerable experience Owen Clarke Design already had in the design of wider, twin rudder, twin daggerboard swing keel designs. By 2002 we had considerable tank tesitng data from six models along and with an adjusted/calibrated VPP for this type of boat Indeed, in 2003 we believe we were the only design office to have tank tested wide hull/twin rudder configurations at that time. The first tank testing phase was used to create a datum from which the wide hull model designs could be compared after they too were run in the tank. Although we were in contact with a number of top syndicates, in the end, time ran out and for most the money never arrived. To compare/virtual race profile against OCD's twin rudder hull froms Clay Oliver developed a systematic series of narrower Volvo 70 candidate designs with a single rudder. Clay Oliver and Merfyn Owen went on to maintain a close working relationship, between 2005 and 2007 OCD tank tested a further five 1/7th and 1/3rd scale swing keel designs for the Temenos, Ecover 3 and Aviva Open 60 projects. During this period they worked together on the Mari Cha 4 project as well as creating a twin rudder Volvo 70 design for the 2008 race. Yet again, the syndicates that showed an interest in having an OCD/Clay Oliver Volvo 70 failed to attract final funding. 1/7th scale tank testing in 2002 OCD's sixth swing keel model which featured a chine in the hull. This was part of a three hull systematic series for Mike Golding's Ecover 2 campaign. Having now designed eight Open 60's our Volvo 70 design team are in a better position than ever to design for the next Volvo Ocean Race. Our team's cumulative tank, numerical analysis/cfd and wind tunnel experience also includes hundreds of hull, rig and appendage testing programs outside Open 60 world, in classes such as Americas Cup, Whitbread, Volvo along with maxi projects such as Mari-Cha IV, Genuine Risk and the elapsed time winner of the 2011 Sydney Hobart, Loyal (ex Maximus). All that experience has been used on the design of the Owen-Clarke/Clay Oliver IMOCA Open 60's Ecover 3 and Aviva. In 'Open 60 world' we have dealt with many of the same challenges that exist in Volvo 70 design on numerous projects on the water, at "full scale" for the last twelve years and this has helped us close the loop between theory and reality. Of course no one has a monopoly on good ideas and any major sailing campaign is best served by the welding together of an extended team combining all the experience of the sailors, designers and the builders. That's how we work on our sixty programs and of course that's what Clay's been used to as a lead designer for Team New Zealand for four Americas Cup campaigns. Six models models being tested in 2010 as part of Owen Clarke/Clay Oliver's latest canting keel race program. This is to be followed up by a second round of testing using 1/3rd scale models in October. This graphic iillustrates an ongoing 60' 2010 design program in which we're running a six model tank test program in parallel with CFD. CFD has been used as standard for desiging all our Open 60 yachts since 1999. CFD analysis being carried out by Juan Meseguer of BMW Team Oracle as part of the RigCalc/Membrain spar design work for OCD's canting keel Open 60 Ecover 3 in 2006. We are in a constant process of reviewing CFD/numerical analysis technology by attending design seminars and conferences, referring to professional journals and consulting with individuals and organisations specialising in CFD. This is one of the continually changing aspects of modern yacht design. In 2009/10, numerical analysis/CFD will be offered to syndicates as one of the design tools along with vpp to isolate canidate designs prior to tank testing for both Volvo 70 hulls and appendages. Technology and research aside, our experience in designing and sailing swing keel designs going back to 1992 is fundamental to the understanding of the workings of the Volvo 70 as witnessed by some influence we had on two projects during the first race. Most people know that halfway through we were called into help the Brunel campaign after the in-port race in Melbourne. At very short notice our re-balancing of the boat and new daggerboards helped transform the boat's performance in the final stages of that event. Also, on ABN Amro One as Mike Sanderson has acknowledged in an article by Tim Jeffrey in Seahorse magazine: 'You can't begin to understand how influential that boat (Pindar Open 60 designed by Owen Clarke Design) revamped into a VO70-style was to Moose. He stepped on, found the rig in one place, thought it was crazy, moved it and slowed the boat down!' In another part of the same article when they'd been having trouble with ABN 2 after her launch 'Moose eventually said: "Why don't we look at Pindar's? and Juan rang Merf Owen. " They talked and came up with 12 degrees of splay angle, which I think most use in the Open 60's. "When they were wider you just jerked from one rudder to the other as one took over. After the change we just said, Wow! These boats are awesome!" Owen Clarke Design/Clay Oliver IMOCA Open 60's Ecover 3 and Aviva, during two boat testing. 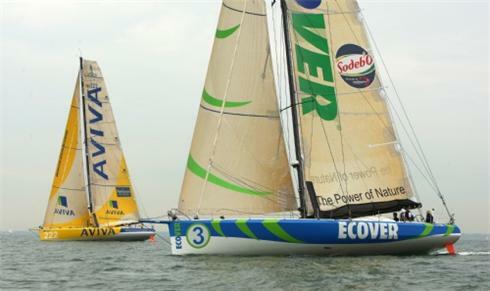 Ecover 3 was leading at the half way stage of the 2008 Vendee Globe before dismasting south of Australia. OCD's Volvo design partner Clay Oliver's reputation and experience needs little expanding on. Few know however of his ground breaking early work in CFD for the America Cubed project and years as a leading designer at the Farr office working on the Whitbread 60 and Americas Cup. It was during this time he developed (and continues to do so) for himself and later marketed the most widely used commercial vpp program used today, WinVPP. Most however would associate him with his leading involvement in the hull design, vpp and tank testing for Team New Zealand. On the other hand, some will say/think that Owen Clarke Design are the relative 'new boys' on the block when it comes to fully crewed 'Grand Prix' race events. We don't agree and would go further and say that we can bring our extensive experience and unique knowledge from outside of the class that can only be of benefit to any project. In addition it is clear that the rule has changed again for the next race including an increase of the minimum weight to more easily attainable figure. This will reduce to a great extent any advantage existing designers/projects might have in terms of engineering from their participation in this race. Q: Which design office has built sixteen twin rudder swing keel tank test models at 1/7th and 1/3rd scale and since 2000 has designed more swing keel Open 60's than any other office? Q: Which design office has broken the hold of the French by winning the singlehanded transatlantic race twice, in 2000 and 2004 as well as the Route de Rhum? Q In the 2004 Transat race, as well as the winning boat (Ecover/Mike Golding), who designed the boats that came in third (Pindar/Mike Sanderson) and fourth (Skandia/Nic Moloney). Q. Which Anglo-Saxon designers have been designing twin rudder and swinging keel monohulls since 1992 and have had boats finish second and third in the 2000 and 2004 Vendee Globe? Q: After falling off the back of the leaders in the South Atlantic High which boat completed the marathon passage from the Cape of Good Hope to the finish of the Vendee Globe in an amazing 1day 19hrs 29mins faster than the winning boat. Q: In the 2007 Barcellona Round the World Race, which design office had a podium finish and were the only designers to have all four of its entries that set out finish the race? Q Who's been working in design teams with IACC designers utilising CFD, tank testing, flow and membrain and a wide range of the latest design tools since 1999? Q Should you consider working with Owen Clarke Design, Clay Oliver and their associates for your next Volvo campaign? A: We're more motivated than ever to produce a winning design for this race. It's your call. We want to hear from you.